e) Wants to do a Hitler again but this time only right. ‘The Believer’ is the story of not some Hitler-frenetic Nazi who wants to destroy Jews instead he’s a Jew himself who intends to erase his own clan. Jewish-Nazi would be the right word. It’s inspired from a real life incident and traces the life of a believer in destruction. He believes in God most than the others and to the extent that God is the most depraved man around. And he explains through the course of the movie ‘How modern world is a Jewish disease? It will pin you to your seat-Yes as it takes you on a different planet even before the initial title rolls over. You may not agree with what he is doing or plans to do but it will keep you intrigued all through with the ‘Why’ part of it. Riveting –Yes as the dialogues are so catchy and yet so deep. It’s a very well written film. Volatile- Yes as it’s not static and every present scene evaporates the one preceding it. But once over all of them get condensed in your mind. The film is obsessed with Jews but not me. I am just obsessed with Ayn Rand who coincidentally happens to be a Jew. But that apart among all the four Jew Flicks that I have seen this one stands out. Schindler’s List I saw way back. I didn’t get much of it except it was a Spielberg(he's a jew as well) film and won many Oscars and shows the manipulability of a Jew Businessman who’s concerned for his own men. Munich, again a Spielberg gem showed the reveng-ibility and determination of Jewish clan in Israel after what happened to its Athlete Squad in Munich. Defiance (Daniel Craig starrer) the most recent one, I saw it a couple of months back. It’s again biopic and reflects the struggle and perseverance of Bielski Brothers(again jews) and their triumph against odds. “How much a role does a race’s background play in shaping the cultural, spiritual and metaphysical view of its clan? I don’t know much about the race part but the atheist I am I loved the protagonist for all his God bashings. Performance-Ryan Gosling has given the best debut performance you will ever see. He’s intensely intense, vinegar-ly vulnerable, shrewdly sophisticated, strikingly sensitive and yes enticingly emotional in between. Outstanding. It’s been a week since I saw the film still this performance is hard to get out of my mind. He keeps coming back esp with that “Jew Jew Jew Jew Jew Jew” thing he does in a scene. Ryan definitely has the Depp-th to be Pitt-ed among the De(a)mons and still be able to Cruise overriding Jude Laws(if any) and be the ultimate Lion-ardo. Now that is a huge statement, ain’t it? From his wiki-pedia page I came to know that he has already been placed among some sexiest men list and Star of the Tomorrow prediction. He has already won some critic awards and has been nominated for Oscars(if that is the benchmark). His choice of roles in films like The Notebook (saddi U Me aur Hum) and Half Nelson shows his prudence and performances there in- his range as an actor. And he’s still under 30. I will definitely watch out for him in the coming decade. Ranbir Kapoor take note. He is of your age and no I am not asking you to imitate him just learn. And I am saying, bugger, as I have expectations from you. Listen you can imitate also but the way an Aamir does a Tom Hank. Nonetheless the female lead (Summer Phoenix) -she plays the perfect foil to Ryan. And off course her well rounded breasts. “Are these the most beautiful twin rounded peaks ever?’ You will say immediately after that love making scene-Loudly if among bunch of bums and Silently if your girl is around. That apart there is also a scene where both are half naked and their lips closer and you expect them to make out, instead they end up arguing religion. Awesome direction that. She outdoes Ryan here with those inviting lips, inquisitive eyes and intelligent remarks. 95-5 % Principle- A much hyped American History X is on all greatest lists and The Believer only on Sundance Film Festival! It hurts. Just because American History X was a trendier subject (Black vs Whites) you would give it every thing. But an effort on an even bigger scale is not accepted the same way. 'Am..X' is s good flick indeed but 'The Believer' too is not far behind except in accolades it got compared to 'Ame....X'. a) 95 % of the films are crap but these crap films ensure the rest 5% are there. b) 95 % audiences who do not watch any movie of the ‘5 % classy lot’ always discuss them as doing so make them classy. c) 95 % of the movies in the classy ‘5% lot’ are commercial disaster. But again 100 % of the classy lot gets critical acclaim as this is the only way critics do stay in the business. d) Again it is this ‘5% classy’ lot that strengthens the 100 % audiences’ belief in cinema despite the subconscious acknowledgement that 95 % of it will still be crap. So if a ne0-cinephile wants to make a class apart film he should know that chances for the film to do well at BO are 5 % of the 5 % which in real terms is 0.25%. And you should know by now which one do I belong to or to say long to. And here at this forum I cross out Oscars and Cannes' and Filmfares from my ‘would get to one day dream.’ It’s Sundance all the way. Sundance has given us the bombastic basher of conventionality Quentin Tarantino, it brought to us the ultimate maverick, Robert Rodriguez, the man who has single handedly re-written all the rules in film making and also Sundance has given the well deserved Grand Jury Award to The Believer. Coming back to ‘The Believer’, to overcome this disbelief I picked the gems from world cinema this week 13(Tzameti), 8 &1/2, and 7th Seal, the last two with the ‘greatest film ever made’ claim. Fellini is Fellini and Bergman is Bergman but this number theory didn’t work. The problem was not the language but RELATIVITY (Einstein…. wink). I just couldn get out of ‘The Believer’ mode. I left them just after first 5 mins. I know you are attributing me with these adjectives for making it so long. But when I write, I write. Also you made a big mistake by choosing these names and it entitles me to write few more lines. These are titles of the soon to be released films of my favorite film-makers, Vishal Bhardwaj and off course Tarantino. Both are trying something they have never done before. Bhardwaj is venturing into ‘Caper-Genre’ and Tarantino is waging a war against war-epics. Both are known to out do themselves so my eagerness is justified and just see the coincidence in the titles chosen. But when both films will take a couple of month to hit the theaters, the question is what we do in the meantime? 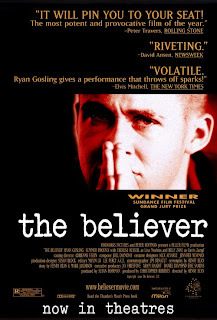 Why don’t you guys have a dekko at ‘The Believer’ and I on my part will try if the number theory works this time.